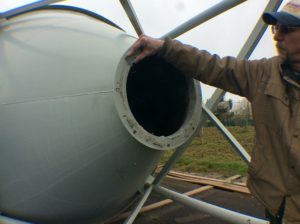 In standard installations the cement delivery auger mounts directly to the bottom of the 200bbl portland cement storage silo. 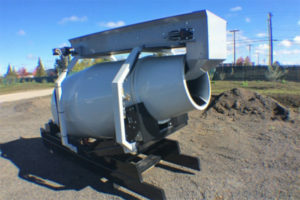 The Silo Slide Gate is great insurance against cement loss out of your silo. 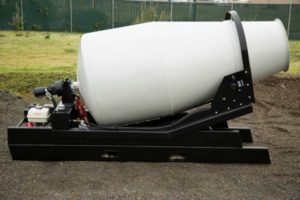 When there is a maintenance issue with the auger, you run the risk of loosing your silo-full of cement because you cannot stop the flow of powder… UNTIL NOW! 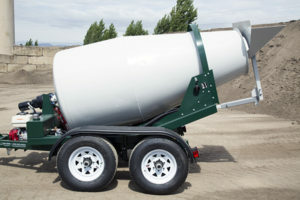 Save your cement with the Cart-Away silo slide-gate. 2. Make sure silo is completely empty and remove your existing cement auger. Set the auger aside slightly to give you room to work. Use this opportunity to inspect and clean out the auger transition and the inside of the silo cone. 3. 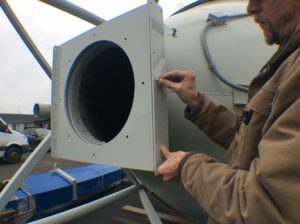 Scrape away any silicone residue left on the silo flange. 4. Place the slide gate parts beneath the silo. 5. Position the slide box assembly so that the open sides face the front and rear of the silo. These are the two sides where the fill tube and baghouse tube are usually located. DO NOT position the slide box assembly so the open ends are in the same direction as the auger when mounted. 6. Get two of the longest bolts from the provided bolt kit and place them on the flange at opposite sides. You do not need any washer for this step. 7. 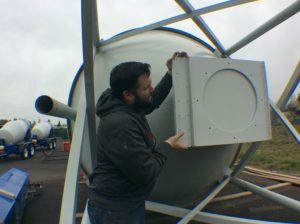 Use a lifting device or another person to lift the slide box assembly up to the silo and align the mounting holes. 8. 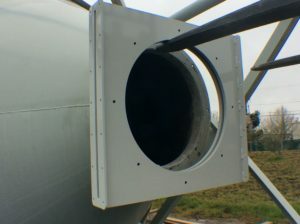 Use the two long bolts and thread them into the slide box assembly using any two holes that are opposite one another on the silo flange. Thread the bolts in until you see threads come through the top flange of the assembly. 9. 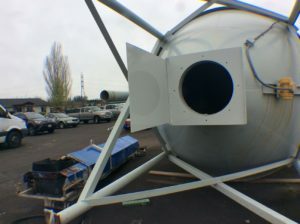 Let the slide box assembly hang from the silo flange. You will have a 3/4”– 1” gap between the assembly and the flange. 10. Use silicone to fill much of the gap. Be sure to go around each of the mounting holes. 11. Get two of the shortest bolts from the provided bolt kit and place them on the silo flange at opposite sides. You will need a flat washer and split lock washer for each bolt. 12. Use a lifting device or another person to lift the assembly up to the silo flange. 13. 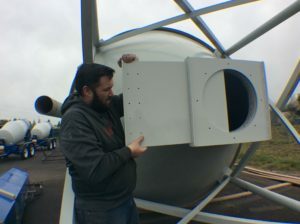 Use the two bolts and washer you have ready and thread them into the slide box assembly using any two holes that are opposite one another on the silo flange. Thread the bolts in until no threads are showing from the top of the silo flange. It may be necessary to use a wrench, but do not completely tighten the bolts at this time. 14. Remove the two long bolts and wipe them off to use later. 15. 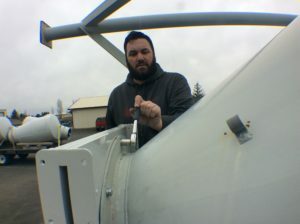 Use the rest of the small bolts, with flat and lock washers, to mount the slide box assembly to the silo flange and tighten the bolts with a wrench. 16. When you are finished only a small amount of threads will have come through to the center of the slide box assembly. 17. Position the cement auger beneath the silo opening. 18. 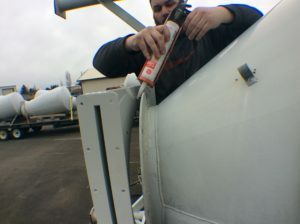 Scrape away any silicone residue left on the auger flange. 19. Get the two longest bolts from the provided bolt kits that were used earlier. Place them on the silo flange at opposite sides. You will not need any washers for this step. 20. 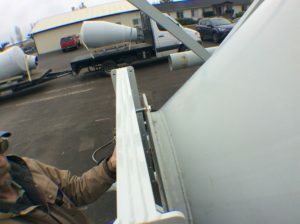 Use a lifting device or another person to lift the cement auger up to the slide box assembly and align the mounting holes. 21. 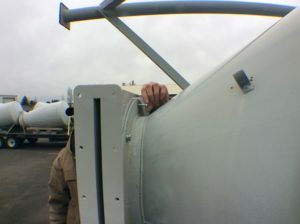 Use the two long bolts and thread them into the assembly thru the auger flange using any two holes that are opposite one another on the auger flange. Thread the bolts in until you see threads come through the bottom flange of the assembly. 22. Let the auger hang from the assembly. You will have a 3/4”– 1” gap between the weldment and the flange that is pinched toward the rear of the auger. 23. Use a lifting device or another person to lift the discharge end of the auger until the gap between the auger flange and the slide gate weldment is equal all the way around. Take this time to also adjust the auger discharge so it is centered in the transition of the loading belt or blending auger. 24. Use silicone to fill much of the gap. Be sure to go around each of the mounting holes. 25. Get two of the middle-sized bolts from the provided bolt kit and place them on the flange at opposite sides. You will need a flat washer and split lock washer for each bolt. 26. 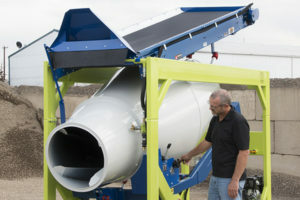 Use a lifting device or another person to lift the auger up to the slide assembly. 27. Use the two bolts and washer you have ready and thread them into the slide box assembly using any two holes that are opposite one another on the auger flange. Thread the bolts in until no threads are showing from the bottom of the silo flange. It may be necessary to use a wrench, but do not completely tighten the bolts at this time. 28. Remove the two long bolts and discard them. 29. Use the rest of the mid-sized bolts, with flat and lock washers, to mount the auger to the weldment flange and tighten the bolts with a wrench. 30. When you are finished only a small amount of threads will have come through to the center of the slide box assembly. 31. Wipe away excess silicone squeezed out during these processes. 32. Take the slide gate and test fit it by sliding it horizontally into the slide assembly. You can see how the gate will work. 33. Remove the slide gate. Prepare the necessary number of the smallest bolts and their nuts for the small side cap plate. 34. Place a liberal bead of silicone around one outside edge of the slide box assembly openings. 35. Using the small bolts and nuts attach the small side cap plate. Use a wrench to tighten the bolts firmly. Wipe off excess silicone. 36. Prepare the necessary number of the smallest bolts and their nuts for the larger side plate/slide gate. 37. Place a liberal bead of silicone around the remaining outside edge of the slide gate weldment opening. 38. Use a lifting device or another person to lift the side plate/slide gate up to the weldment. 39. Using the small bolts and nuts attach the side plate/slide gate. Use a wrench to tighten the bolts firmly. Wipe off excess silicone.